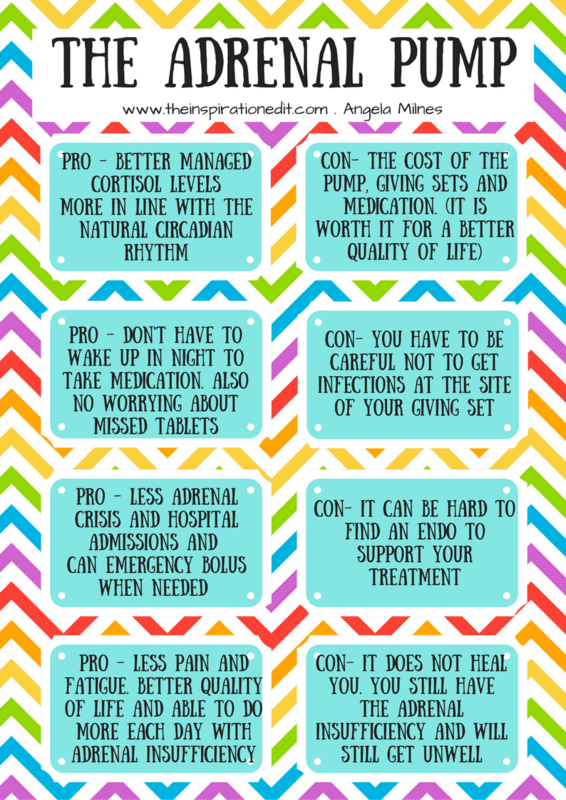 Recently I was asked to share my thoughts on the pros and cons of using an Adrenal Pump to manage Adrenal Insufficiency. I’ll begin by saying accessing subcutaneous hydrocortisone infusion therapy is extremely difficult. After being diagnosed with secondary Adrenal Insufficiency along with other conditions my pursuit for better treatment began. I first heard about the Adrenal Pump method of treating Adrenal Insufficiency in 2013 through a Facebook group I was a part of. 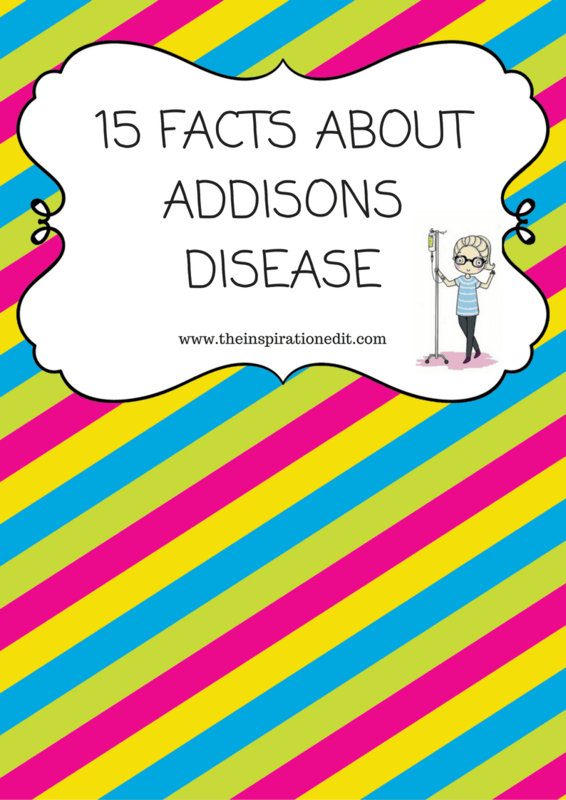 I heard how it had helped to improve the life of two Addison’s patients in the USA. I also met a woman in the UK who had taken part in a research trial in Manchester at the Royal Salford hospital under the care of Dr Angelou Kyriacou. I finally had hope that my health might improve. 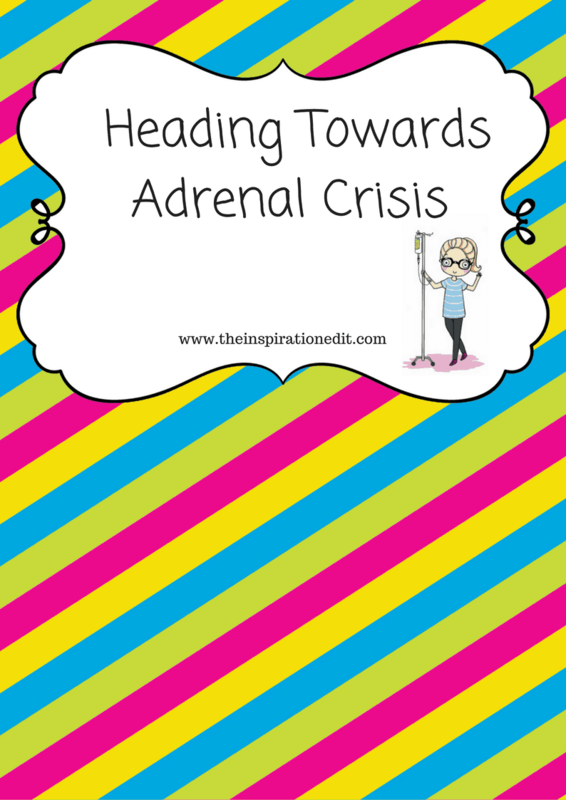 I dreamed of getting an Adrenal Pump and the next time I had an Adrenal Crisis and was hospitalised I asked the Endocrinologist if I could have the same treatment. I must admit my request was met with laughter. The Endocrinologist told me it’s not a treatment and I was getting confused with diabetics. This was not the case, it was the Endocrinologist who was not clued up on this new method of treatment. I attended a meeting with my appointment NHS Endocrinologist and my first question was “can you consider giving me an Adrenal Pump to better manage my health. I was straight away given a NO. I recall the reason being, “it is expensive and there is a risk of the giving set failing” resulting in adrenal crisis. At the time I took the Endo’s word for it but I did not give up on my pursuit. 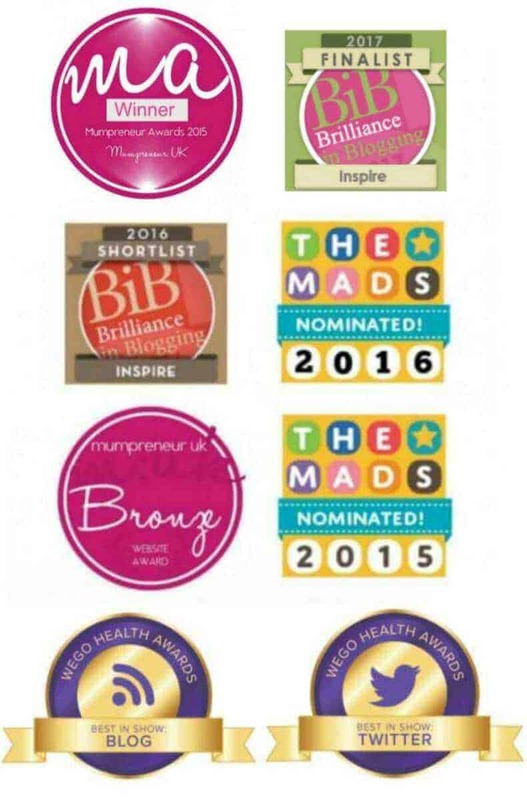 I started a blog in 2015 announcing my goal and dream to access an Adrenal pump to help keep me out of hospital. 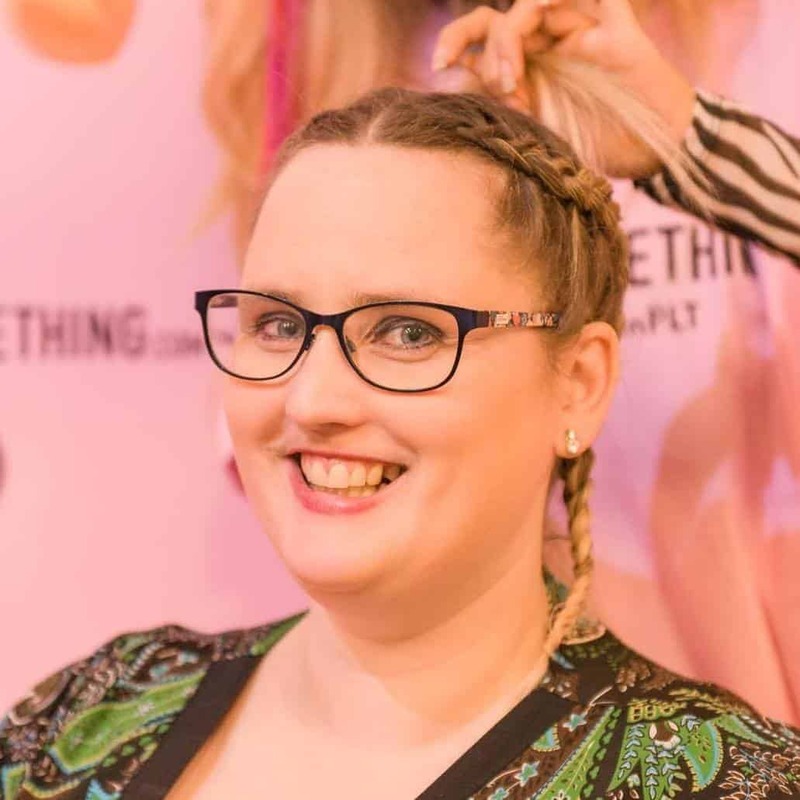 During the first three years of my diagnosis, I had been in hospital over 22 times and that does not include the many many appointments and diagnostic tests, a brain MRI, Insulin Intolerance test and much more. Due to my Endo saying NO, he would not consider the Adrenal Pump, I transferred my care to the Royal Preston Hospital in Lancashire. Here I sought support once more for the Adrenal Pump. I was told my medication worked just fine and the pump would not make an iota of difference. I knew this was wrong and clearly my medication did not work. I was in chronic pain, had continual headaches, I was bed bound, using a wheelchair, unable to stand in a morning and continually in a cycle of low cortisol, high cortisol, low cortisol, high cortisol. Every time I returned to Royal Preston I requested treatment via the Adrenal Pump. Each time I was given a different excuse. It was cost, or ineffective, I was fine, I didn’t need it but I continued to ask. Eventually the “real reason” came out and I was told by the Consultant that he simply did not have any experience and knowledge and he would not be comfortable treating me. 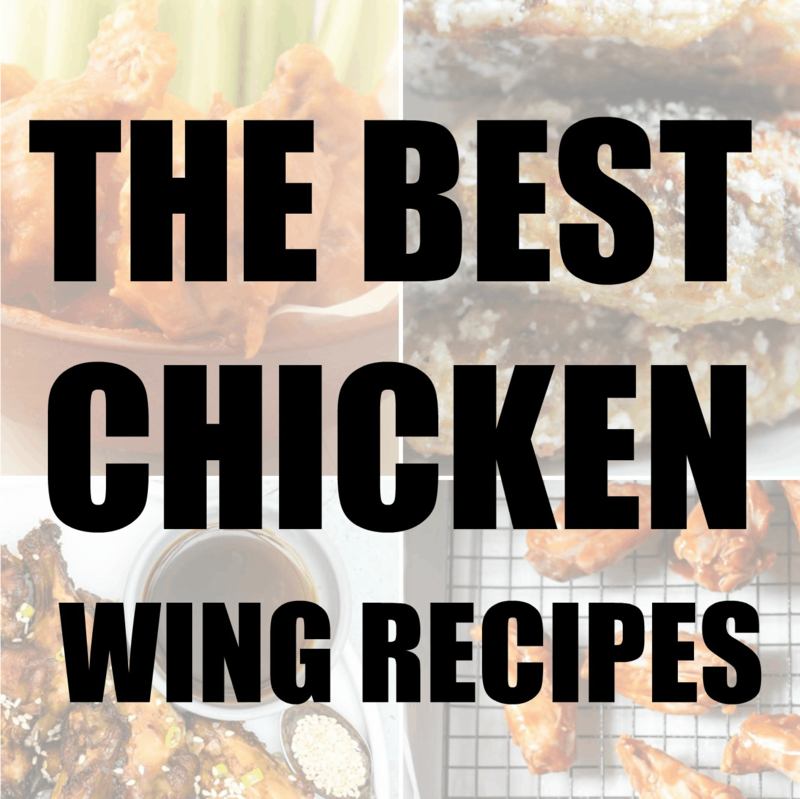 During the three years of investigating and attempting to get an Adrenal pump I did my research. 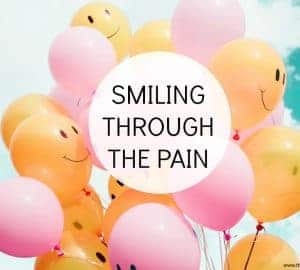 I found every article I could on the treatment. I applied to take part in a study in Bristol but did not qualify as I was a patient with Secondary Adrenal Insufficiency rather than primary. I contacted Dr Hindmarsh, the pioneer of the Adrenal Pump, and although I could not get support due to being an adult, (He works with children) his team wished me good luck. In 2015 I discovered the research papers of Dr Angelou Kyriacou at Royal Salford and saw he and his team had successfully treated a patient with secondary AI with the Adrenal Pump. I was excited. My GP referred me to Royal Salford and I eagerly awaited my meeting with this Endocrinologist. I waited 6 months for my appointment and sadly on the day of my appointment I discovered Dr Kyriacou had returned to Cyprus, a country close to Egypt, Greece and Turkey. On the day of my appointment I met a Dr Tara Kearney. Meeting Dr Kearney was one of the most humiliating appointments of my life. When I shared with her the reason for my transfer to Manchester she was not helpful at all. In fact she told me I was wrong, she said, “There is no such thing as an adrenal pump”, she said “you are wrong and mistaken”, she said, “I don’t know where you have got this information from but no one has ever been treated with an Adrenal pump at Royal Salford”. Without calling me a liar, Dr Kearney pretty much shut me down at every point and said I was wrong. I had the documents on me, I personally knew the patient being treated at Royal Salford with an Adrenal Pump, yet Dr Kearney refused to look at the research and sent me away. In fact, after doing a cortisol day curve, Dr Kearney discharged me from her service and sent me back to my team at Preston saying she could not help me. I continued my fight to get the Adrenal pump and tried my best to save up for the treatment, hoping to find an Endocrinologist willing to help me. I set up a GO FUND ME page and tried to fundraise. 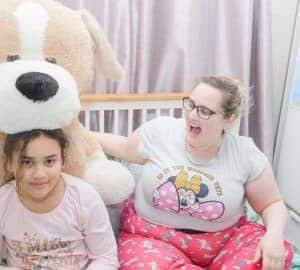 My daughter did a trampoline jump to help raise money and despite a year of fundraising, all I managed to raise was £250. I needed about £5000. I felt a little sad. I’d seen many people fundraise for genuine health needs, for wheelchairs, for cancer treatment, yet having an Adrenal Pump, the treatment which could potentially change my life and keep me out of hospital did not resonate with many beyond my close network of friends who did help the best they could. I figured it was not so much the treatment but the fact, an Adrenal Pump was unheard of, compared to a wheelchair or cancer treatment, yet the treatment could be life changing for me and my child. In 2016 after trying so hard to raise money, I decided to simply work hard, to sell everything we could and get the funds for private treatment. 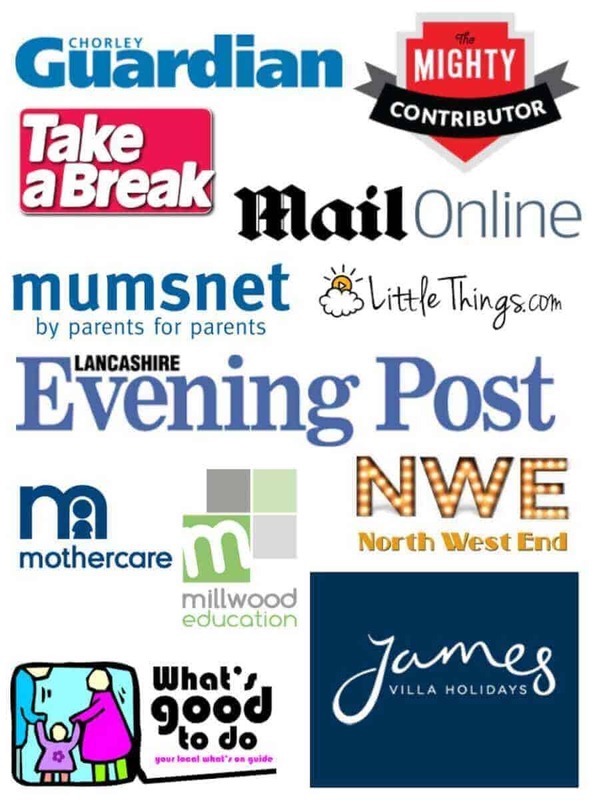 It took a lot of sacrifice but in May 2016 I had enough money to get started on the pump, I simply needed the money for a pump which was around £3000 and a Endocrinologist willing to help me. After all those years I finally found a Doctor in London and in June 2016 my family travelled down to London to request the treatment I was seeking. I found an Endocrinologist willing to set me up on an Adrenal Pump Trial but was asked not to share his name far and wide and this was a first for him and was only a trial. I had to return for the week in July, however we still did not have a pump, the money for a pump or accommodation for a week in London. My husband and I decided to take out a huge loan. We borrowed £4000 from the bank to help pay for the treatment, tests and appointments. I managed to find a hotel willing to put my family up for 4 days at half price in return for a review on my blog The Inspiration Edit. We were all set, but still we needed more money. Then my Adrenal Angel appeared. Erin! Erin lives in the USA and had an old Medtronic Pump. She kindly offered to send me the pump. I just needed to cover postage costs. I was overjoyed, over the moon and ever so grateful. Erin gave me the lifeline I needed and in July 2016 I began my treatment. Within a few weeks of shifting from cortisol tablets to the Adrenal Pump, my life had changed. The headaches stopped, the chronic pain throughout my body ended. I came off pain medication which I had been dependent on for 3 years. I no longer suffered to the extent I did. My body strengthened and I began to walk, not far but could walk and the wheelchair I depended on was no longer needed to wheel me down hospital corridors. I could walk a good 50 meters and rest without feeling like I would collapse. My mornings changed. Where before I would wake with low blood pressure and be unable to stand until around 2pm in the afternoon, I could now get up in the morning. I would still be tired and fatigued but for the first time in 4 years I could get up with my child and help her with breakfast and preparing for school. Most significantly, I did not return to hospital with an adrenal crisis for 6 months. I did have a bout of food poisoning in December 2016 which lead to a hospital admission, but I managed to stay out of A and E and the hospital bar that one time for a whole year. This was due to being able to manage my treatment on the adrenal pump. Having a pump has not been easy. It was not easy to find a Endocrinologist to help me. It has not been easy to pay for treatment and follow up appointments. I have applied twice to the NHS and requested support to fund the giving sets for my pump but have been declined each time. I appealed the decision and despite the obvious improvements for my life, the panel said there is no clinical evidence that the Adrenal Pump has benefited me. This is clearly not the case and I continue my fight to get the support I need through the NHS. In 2017 I requested support from the Royal Preston Hospital, during appointments and in writing. I visited Manchester hospital again and unfortunately was again seen by Dr Kearney. She acknowledged the change in my health and the benefits of me being on the Adrenal pump but refused to support me and discharged me again suggesting me in writing I visit a Dr who has experience with the pump. She actually compared me to a cancer patient who could not get the breast cancer treatment needed because of cost. However the research undertaken by The London Clinic where I was treated clearly show that the pump is more cost effective and that it has saved the NHS thousands, along with improving my quality of life and the life of others who took part in Adrenal Pump research. 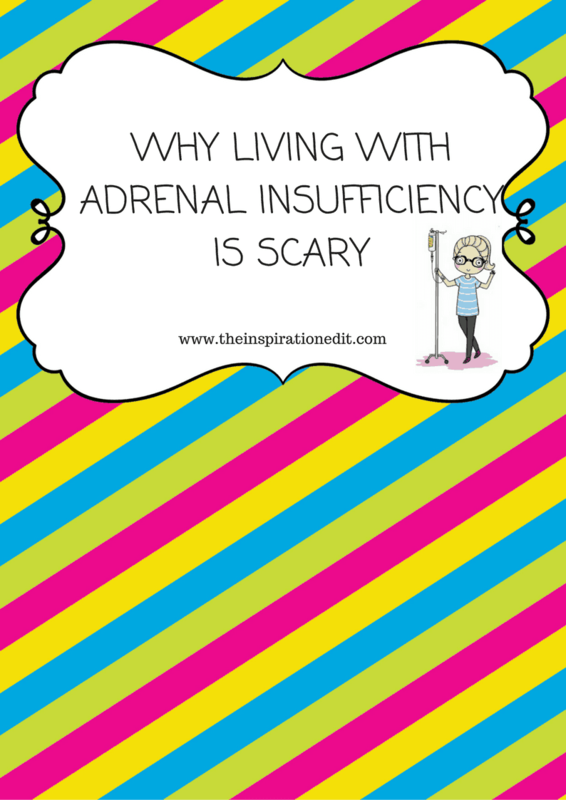 Living on an Adrenal Pump did not take my Adrenal Insufficiency away. I still get unwell. I am still a patient with chronic illness but my condition is better managed. There are pros and cons to the pump and I have written an article on this. I am still unwell every day. I have chronic fatigue and get sick all the time but not the point I have to enter hopsital. I am unwell at home and being unwell at home is much better than being unwell and away from family. 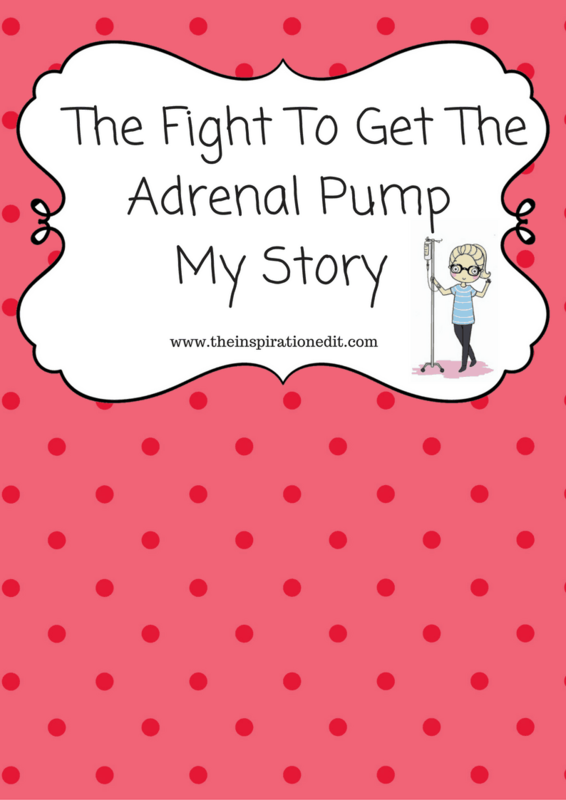 My Adrenal Pump journey continues and I will continue the fight until I am given the support I deserve. Since having my treatment more and more patients with Adrenal Insufficiency are getting set up with the treatment. It is costly but worth it. The treatment may not be necessary for those who are healthy and manage well on cortisol tablets but for those who struggle in the way I did it is a brilliant method of treatment. In my story there are Heroes and Villains, Doctors willing to do all they can to help patients with AI, to have a better quality of life, doctors who take part in medical research and who really care. There are also specialists who are overstretched, unwilling to try new things and unwilling to help improve our lives. These doctors simply want to put a sticking plaster over our symptoms and send us on our way until our next fall or crisis. It is the Endocrinologists such as Dr Kyriacou, Dr Carrell and Dr Khoo who are able to help ADULTS with Adrenal Insufficiency to gain a better quality of life that deserve praise. It is Dr Hindmarsh who pioneered the treatment for children who deserves our applause and I would like to hope that others will slowly follow in their footsteps, that they will brave the Adrenal Insufficiency war and help bring this treatment to the forefront of our lives. 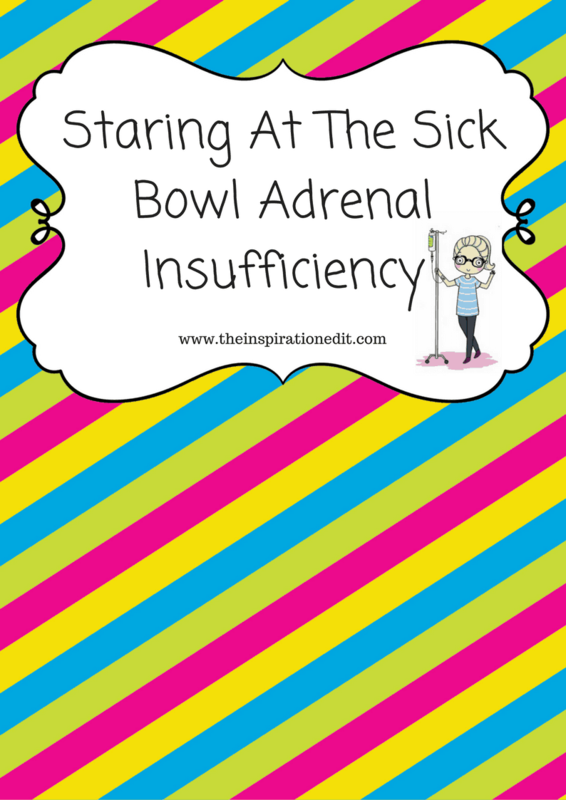 Read More Posts About Adrenal Insufficiency And My Health Journey Here!